The sustainability of construction (commonly referred to as Green Building) has become a goal for builders across the globe. A great deal of attention has gone to reducing cement during construction and minimizing power and water consumption during operation. An often-overlooked parameter taken for granted is the durability and service life of the final structure. However, this is undoubtedly one of the key parameters influencing structural sustainability. Extremely corrosive environments call for extremely durable structures. This is especially true in the Middle East, where reinforced concrete is under attack from many angles. Near the coast, salt spray may attack reinforced concrete structures above ground. Below ground, locations with high water tables can expose concrete foundations to harsh groundwater of greater salinity than seawater. Even Sabkha soil can be a problem, with mineral deposits creating soil three times as saline as seawater. These high chloride environments can easily begin the corrosion process on embedded rebar. When the rebar rusts, it causes expansion, leading to concrete cracking, spalling, and deterioration. 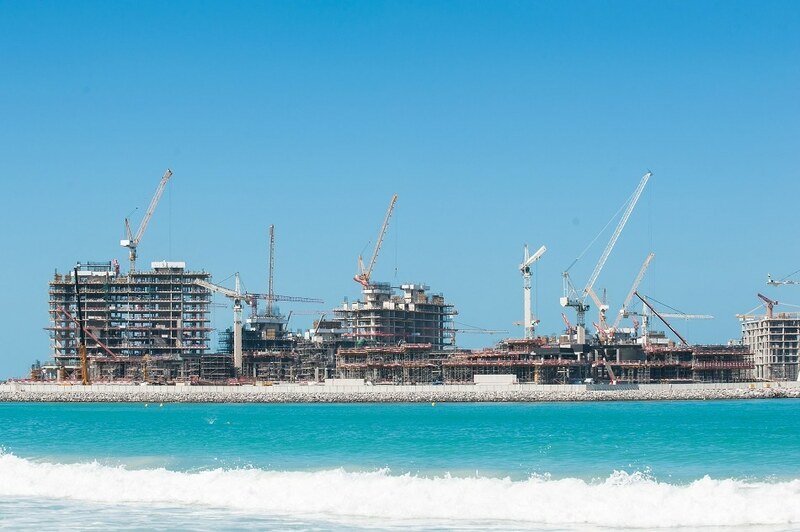 To combat these corrosive elements and extend the service life of structures, a number of new structures in the Middle East have been using Cortec’s MCI®-2005 as a concrete admixture. This is a Migrating Corrosion Inhibitor (MCI®) that travels through concrete to form a protective molecular layer on embedded rebar. It consists of a mixed inhibitor that will protect the rebar at both the anode and the cathode of a corrosion cell. In addition to providing durability, MCI®-2005 is safer and more sustainable, being made from 67% biobased content (a USDA Certified Biobased Product) and NSF Standard 61 approved for use in potable water tanks. While durability is important for almost any concrete structure, it is certainly an issue where the world’s tallest building is concerned. At 828 meters (2,716 feet) high, Burj Khalifa Tower in Dubai, UAE, must be supported by a base of 192 piles descending more than 50 meters underground. This foundation is exposed to harsh groundwater. As the building designers looked for materials that would help Burj Khalifa achieve a 100-year service life, they chose MCI®-2005 out of a number of products evaluated for use in the substructure. MCI®-2005 would give the substructure added protection from its exposure to extreme chlorides in the groundwater, increasing the service life of this critical foundation, and in turn helping to sustain the rest of the tower. By using MCI®-2005 in severe environments like those surrounding Burj Khalifa, buildings will have a stronger resistance to corrosion and therefore possess greater durability. Increased durability will mean fewer repairs, greater structural integrity, and a longer service life, all leading to a more sustainable structure with the use of MCI®. MCI®-2005 conforms to the following standard test methods: NSF Standard 61 by UL (Potable Water Applications Approval), ASTM D-6866-11 (Determination of Biobased Content), and CC-022 (Electrochemical Impedance Testing).